Swim course map - 2.4 miles (2 x 1.2 mile loops) in Mirror Lake. Note the (relatively) small size of the lake, which meant that the current generated by 2000 athletes swimming counter-clockwise makes for a very significant whirlpool effect - nice draft! Bike course map - 112 miles (2 x 56 mile loops), featuring a HUGE 6 mile downhill on Route 73 after North Elba, and a correspondingly huge 13 mile uphill coming back on Route 86 after Whiteface mountain. 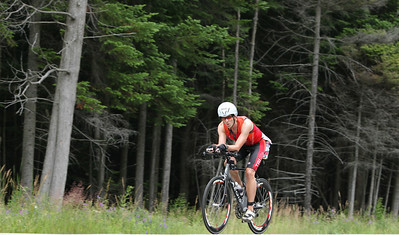 Beautiful Adirondack views throughout! Run course map - 26.2 mile marathon (2 x 13.1 mile loops). 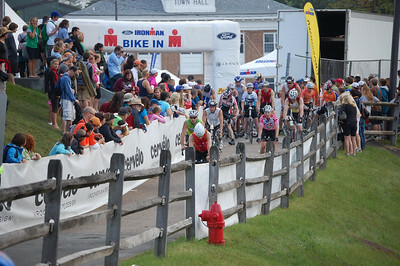 Key challenges are the 2 hills on each loop, one by the Ski Jumps,and one at the turn on Main Street. Not so bad the first loop, but that last hill at mile 24 is very tough! 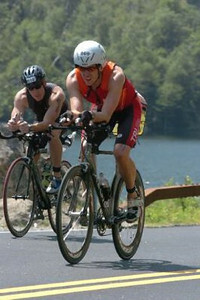 Note also the short 2 mile out-and--back along Lake Placid club Drive. Bike course elevation profile - note (a) the decrease from 2000 feet to 700 feet elevation at mile 15 - 20 (that's an average 5% downhill grade), and (b) the corresponding 1300 foot climb from miles 40 to 56, and then again on the second loop. 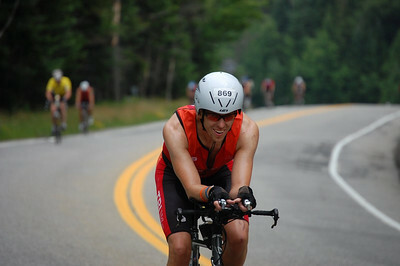 5000 feet of climbing = fun indeed. 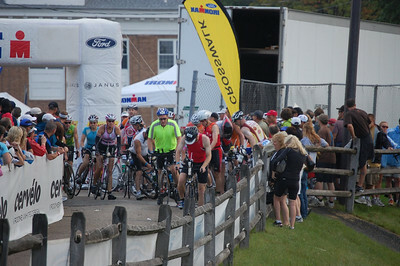 6:50am - athletes congregate on the beach of Mirror Lake prior to the 7am start. 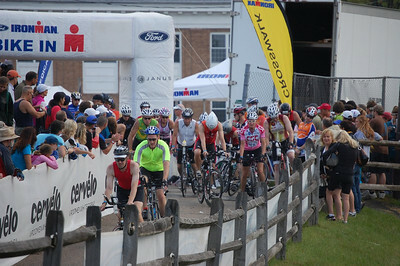 Note the white arch on the left side - we all had to pass through this before we entered the water to allow the electronic timing chips we wore on our ankles to register. 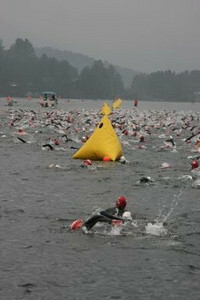 6:58am: Swim start line (see the flags on the upper right side of photo). 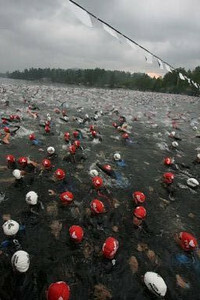 Wonder what happens when you take 2000 swimmers and cram them all into a very small start area? Stay tuned. 7:01 am and the cannon blows - total chaos ensues. People jokingly call it the "washing machine" because of all the white water kicked up. Fun in a crazy kind of way. A sample of the chaos on the swim - the 10-foot high yellow triangular buoys marked the left side of the swim course and gave us something to sight for between strokes to stay on course. 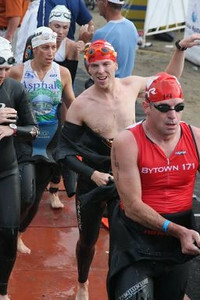 Peter exiting the swim in 1:24. 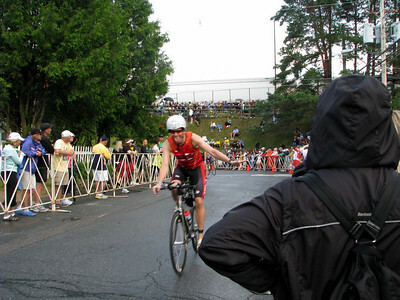 Some rain during the swim was distracting, and overall time not as fast as I hoped, but smooth and comfortable throughout so I was satisfied. The red carpet lead down a 400m hill to run into T1 / T2 at the Olympic oval - an unusually long transition run for an Ironman. 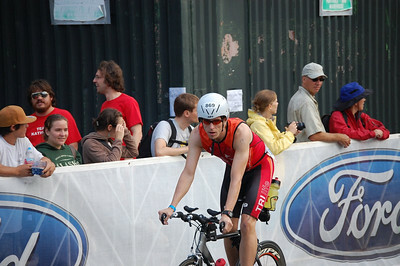 First 500m out of T1 is a large downhill, so here I am riding on the brakes to make sure I don't embarass myself in front of the crowd by crashing! A smile when I finally saw the photographer (my friend Iwan) - note the rose-colored classes as the weather was overcast at this point. 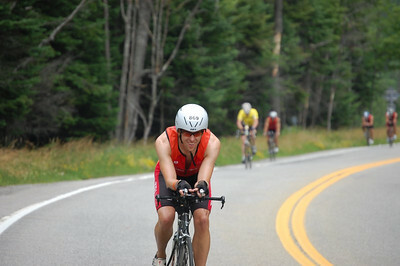 The first few miles of the bike course are through Lake Placid neigborhoods enroute to the big 5 mile downhill. Key challenge here is watching out for other athletes and spectators - very lame to crash in the first 10 miles due to inattention! 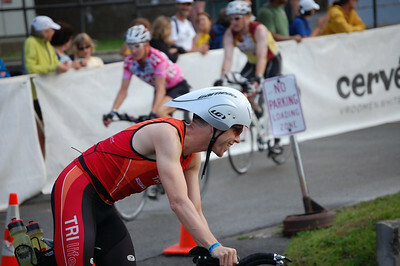 Peter heading out in the first 10 miles of the bike course through the outskirts of Lake Placid town. And away I go...only 105 miles left to go! 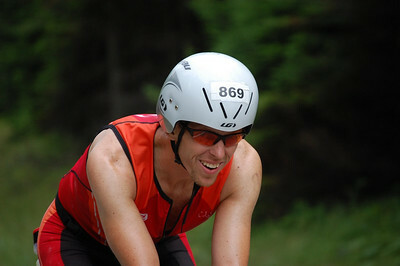 Time trialing in full aero position on the flat portion of the course between Keene and Upper Jay. 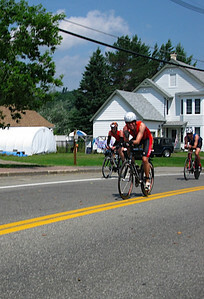 This was the easiest and highest speed segment of the course - also known as the "buffet line" since it was our first place we could take in any nutrition after the long downhill from Lake Placid. 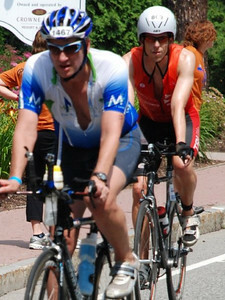 Mile 35: most annoying part of the bike course was a 10 mile "out-and-back" in Hasleton. Riders rode out and back on a long, windy, featureless road (which featured a monument to the NY Yankees, to make it worse :-). 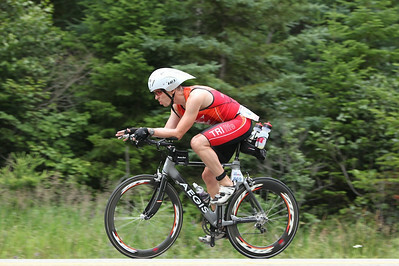 Since it was flat, however, I could make good time and keep in full TT position the whole way. Alternate view of the climb back into LP up "Papa Bear", mile 110. At this point I was really feeling rough - my effort level on the prior 25 miles had been too high, which lead to an upset stomach and an inability to take in sufficient nutrition. Result: classic "bonk" with a light head, mild dizziness, and very low energy. Kept spinning and climbing, however, and eventually felt a little better. 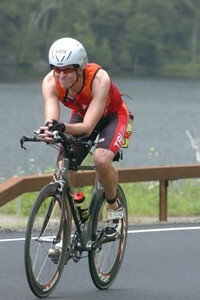 Coming into Lake Placid, just before dismounting the bike in T2. 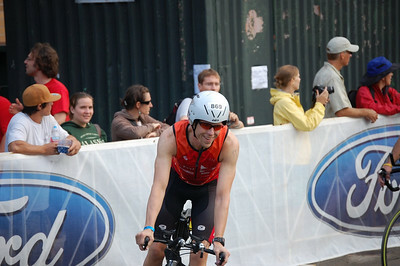 Total time 6:13, but VERY happy to finally be off the bike!